As another day of eerie smoke from wild fires covers much of the West Coast, we are closing our windows, staying inside, not running the vacuum, blowing our noses, and adding drops to our burning eyes. The discomfort is being felt by many, but perhaps the most vulnerable are the elderly. 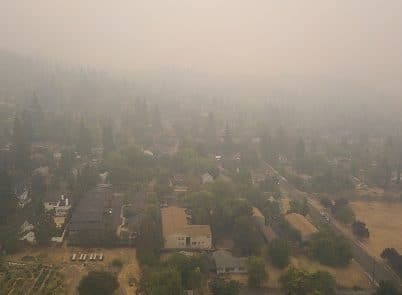 The prediction is the smoke from the British Columbia wild fires will impact air quality through the end of the week in Western Washington. If you are the caregiver of an elderly parent, you may want to take a few extra precautions while this haze continues to linger in the air. 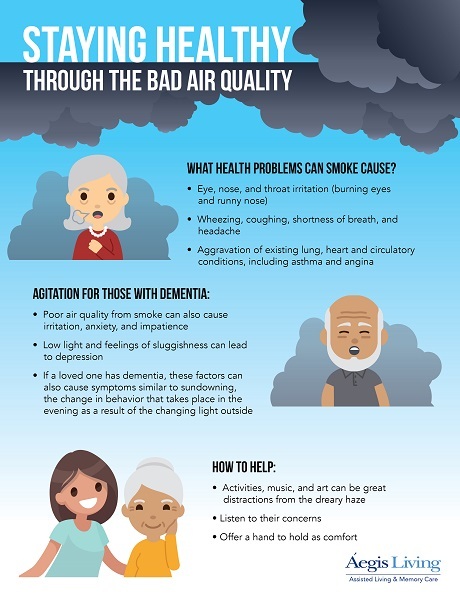 Air quality has reached unhealthy levels for vulnerable groups including the elderly and those who have suffered a stroke, have diabetes, currently have a respiratory illness or cold, or those with heart or lung issues such as asthma or COPD. Health agencies are advising people belonging to these sensitive groups to stay indoors, limit physical activity both inside and outdoors, close all windows in your home and car, avoid using AC that intakes fresh air from outside, and use fans to circulate the airflow within your home. Keep a close eye on how your parent is feeling and acting. If your parent has asthma or COPD, make sure to follow their doctor’s directions for taking their medication and following their asthma management plan. Notify their physician if there is a change in their condition or their symptoms worsen. Stay healthy during bad air quality. As the smoke blocks out the sun, some elderly individuals may not realize the weather is still warm outside and within the home. Encourage your loved one to stay hydrated to beat the heat. It’s recommended to drink at least 8 glasses of water or the equivalent per day. Entice your loved ones with flavored waters, lemonade, watermelon, fruit juices, or popsicles. Coffee and alcohol consumption should be limited because caffeine and alcohol are diuretics. Delay working out and physical therapy until the smoke clears. With the dark outdoor haze, some seniors may be disoriented by the low light whether it is morning or evening. This change in vision and poor air quality can lead to confusion, particularly for those suffering from dementia or memory loss. Try to keep their daily routine as regular as possible. Have them wake up and get dressed in the morning at the usual time. Keep their meals throughout the day on schedule. And make sure they get plenty of sleep and go to bed at their normal bedtime. If your parent is experiencing vision changes, headaches, confusion, or dehydration due to the smoke, they may be more vulnerable to a fall. Falls can be very dangerous for older adults so keep items clear from walking paths, use rubber-soled shoes indoors, make sure rugs are secured, and encourage them to use their walkers, canes, or grab bars for stability. Fall prevention is just an extra precaution to keep in mind during this temporary change in their environment. The smoke is also known to cause irritation, anxiety, and impatience. The low light and feelings of sluggishness can lead to depression or feeling blue. Activities, music, and art can be great distractions from the dreary haze outside. Be there to listen to their concerns and offer a hand to hold as comfort. If your parent has dementia, they may suffer from symptoms similar to sundowning. The dark smoke and low light can concern them so offer your support and extra attention over the next few days. Until the winds change, the rain washes away the haze, or the wild fires are contained, keep an eye on your senior loved ones. A little prevention can make them more comfortable and keep them healthy before the smoke clears. To find updates on air quality and more information regarding wildfire smoke, visit the Puget Sound Clean Air Agency.